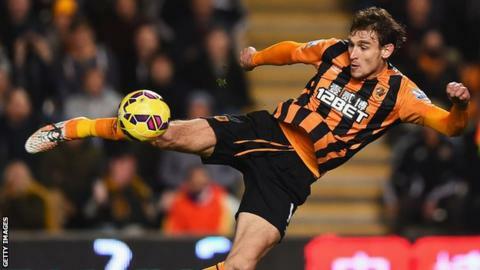 Hull strikers Nikica Jelavic and Abel Hernandez could be out for up to six weeks. Both players came off during last Saturday's 1-0 defeat by West Brom, with Jelavic having a knee injury and Hernandez an adductor muscle problem. A Hull statement said Jelavic "is expected to be sidelined for between three and six weeks". Hernandez has suffered a "small grade two tear for which the normal recovery timeframe is around four to six weeks". Hull are third from bottom of the Premier League and face a trip to West Ham on Sunday. And, on a more positive note, Tigers boss Steve Bruce could have playmaker Gaston Ramirez and forward Sone Aluko available for the game. "Despite initially being ruled out for up to six weeks, Ramirez is making a quicker-than-expected recovery from a groin problem picked up against Everton on New Year's Day while Aluko is also progressing well after missing the weekend defeat at West Brom with a calf injury," said a statement on Hull's website.